A week ago this blew up on our face, although we saved face Monday. 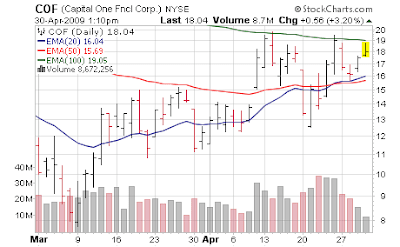 Increasing short in the $18.20 range as the little green line has proven to be resistance - if I'm wrong and Capital One Financial (COF) jumps over, I'll cover. But seriously folks... $0.09 EPS in 2010. Sigh. Up to a 3% stake... will increase if the market rolls over. For the market in general its an interesting spot - the playbook says to get long hot and heavy and get rid of your shorts as we break over S&P 875. I see many stocks who destroyed shorts this morning - multiple companies up 15, 20, 25%. Really who is left to short? Their arms and legs are strewn over the battle field. Which would be the time the market would drop. There are so many "air pockets" in so many charts now - even Visa; it's a vertical rise i.e. no support on any pullback. And Visa is nothing compared to many others. We'll see - take it hour by hour around here nowadays. Every dip to the 20 day moving average on the S&P has been bought but that is now down below 850... so room to downside if pattern persists.